We started the second weekend of the open tour season in 18th overall (2nd in B) after a bit of an up and down showing at Tour 1. And with the new geographical split coming into effect for the first time Tour 2 (South) in Cardiff had the potential for some interesting results. After potentially being a little complacent against Camden at Tour 1 we were determined not to make the same mistake and came out really hard in this game. Our long shots were working brilliantly and we were able to use them to quickly take advantage of the turnovers that we got and establish a big lead. We took half 8-0 and we knew from our Tour 1 experience that they would not lie down and let us walk the rest of the game. They started to rely on their handlers more and it worked for them as we struggled to stop their quick give and go’s. We stayed strong on O though and traded out the second half to take a big 15-8 win. 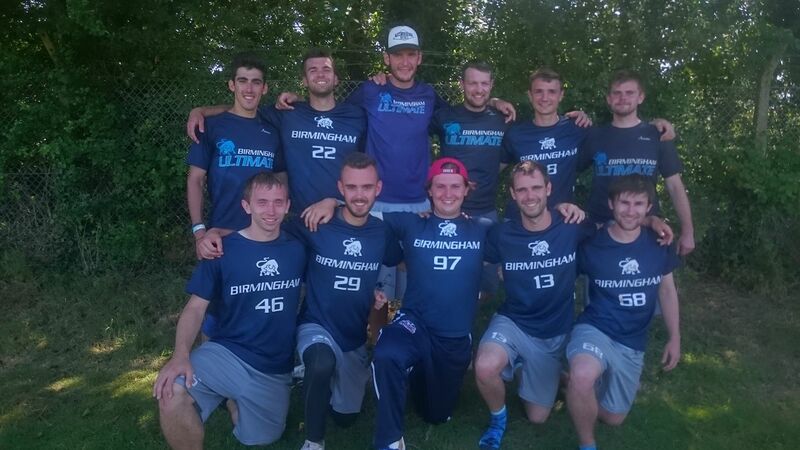 Next up for us were Brighton Legends, a tough team to play against because of their relaxed style; they are quite happy to slow the game down and then punish you when your guard is down. Their zone D and long discs on O caused us some issues to begin with but as we adjusted into the game we took control, walking it in on O through the zone and getting bodies underneath their hucks to get a few crucial blocks. It finished 15-10 as we took a second win of the day. Our final group game was against the unknown quantity of Bristol 2… having finished higher than Bristol 1 at Tour 1 they clearly know what they’re doing, but had there been a bit of a reshuffle after Nottingham? It appeared so as the first few points opened with a number of wayward long discs from both teams, but it was our experience that showed through as we reigned in the hucks and took over with a few well controlled points. From there we saw the game out 15-5. By going 3 from 3 we had finished top of the group and earned ourselves a Sunday morning cross up into A Tour. In that crossover we were drawn against one half of the GB U24 development squad in what was sure to be a hard fought game. And so it proved. We started by breaking them on the first point and taking control of the game early on. A good timeout call by them cut the momentum we had been building and they immediately got themselves back on level terms. In the second half their superior number and conditioning started to show and they stretched out their lead by calmly waking the disc up the pitch, despite the pressure we were applying on D. They eventually took it 10-15 to keep their place in A Tour. That left us in a four way battle for the top of B and we were immediately back on the pitch vs Fire 2. After our exertions in the GB game we started really slowly and they took full advantage, before we knew it we had dug ourselves a big hole to climb out of. But climb out we did; from 3-9 down we battled back to take a 12-11 lead. From there though we had nothing left and our reliance on the deep shots came back to bite us as we tried to force the game ending scores. They kept their heads though and made us pay by closing the game out 12-14. After some time to recover our final game was against Cloud City and we started well, scoring the first two or three points. After that though they showed up brought it back level. Each time it looked as though a team would take the game away the other wrestled back the momentum and so it came down to the final point at 14-14. We got the crucial turnover and started our march up the field, only to falter at the worst moment and give them the disc back. This time they made no mistake, putting the point in and taking the game 14-15. A gutting way to finish a really close game. Another inconsistent weekend then, on Saturday we played with confidence and got the results to back it up. On Sunday we battled hard but faded towards the end of all three games, dropping back to finish in 20th (4th in B). One final weekend on home turf to show what we can do – bring on Tour 3 (North) in Brum!